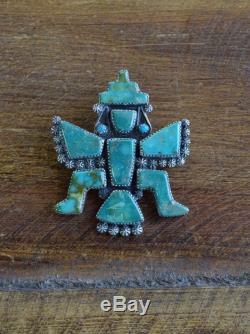 Breathtaking vintage Zuni sterling silver turquoise Knifewing pin by Carlos Tsipa. The beautiful green turquoise stones are perfectly cut to resemble the knifewing kachina. 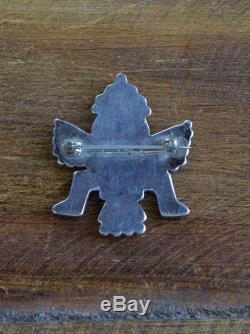 This piece measures about 2" tall and 1 1/2" wide. 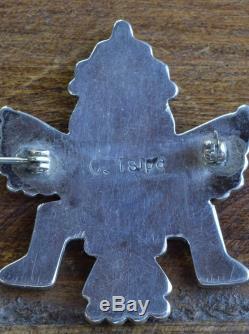 Tsipa and we guarantee that it is sterling silver. Perfect addition to your collection! Feel free to ask any questions and thank you for looking! The item "Vintage Zuni Turquoise Knifewing Sterling Silver Pin by Carlos Tsipa" is in sale since Monday, January 16, 2017.